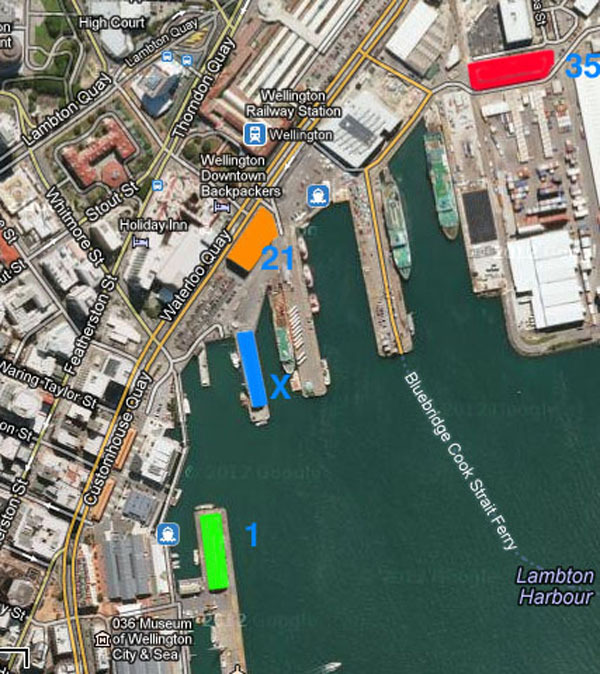 Interesting news today that Shed 35 at the Port is to be proposed as a site for a new Market within Wellington. I haven’t got a photo to hand, but for those that don’t know, Shed 35 is the last of the big old brick sheds on the waterfront, surrounded by Harbour Board land. I haven’t been inside it – but then again, unless you were a wharfie, who would have? So – what’s it like? I did have the good fortune to manage to see the inside of the old Shed 21 before Athfield Architects converted that into a set of upmarket apartments. While I’m sure that Aths have done a nice job inside, it is a real shame that shed got taken away from Wellingtonians – the sort of thing that I don’t think would be allowed today. The space inside there was fantastic – large, open void, windows admitting shafts of light, a space for all Wellington. The sort of space that doesn’t exist anywhere in Wellington now – at least, certainly not along the waterfront. As a site for a market, the old Shed 21 would certainly have been a fantastic space. As a site for apartments, it is a tragic waste for Wellington, although great for the few lucky sods who get to live there. Our windy little city is surprisingly well off for markets right now, a big change from juste a few years ago. There is the veggie weekend market on the Willis St / Vivian St site, still popular with locals, despite the plethora of second-rate sellers of stale cauliflower. There is the much more popular market in the transition zone near Te Papa, where standard Veges mix it with the occasional sausage sizzler and random craft stalls – I think that one is Sunday only? Or is it Saturday? I keep forgetting. There was a small indoor market at the Herd St Post Office building, in the refurbished zone between old and new, but that seems to have died yet again. Honestly, that building has had more rebirths than you can shake a stick at. None of them seem to work, or last very long. And then there is the Saturday morning Frank Kitts undercover market where you can pick up a felt Dollie braided by blind hipsters, or a card with appliqué Tuis and the odd Ethnic pancake. I’m never quite sure of the point of this one – clearly I am not their target market. I want them to succeed, but again – the location seems all wrong. So now there is a new proposal. Will Shed 35 work as a site for a market? Would the other markets keep going too, or do they need to die to make this one work? Will you have to drive there, or can they reorganize the boundaries to make it walkable? To me, that is the big question. Currently, Centre Port is cut off by a long walk down acres of Tarmac. Yet, in reality it is just a short stroll along the waterfront, past the disused waste of space that is the BNZ ground scraper and their unoccupied “public atrium” spaces that have not seen the light of day in a public sense. And then there is the curious camper van site – let’s face it, it’s empty in winter. It would be better to have a couple of good new buildings there – not sure if you caught it hidden away in the paper, but WWL is looking at planning some smaller buildings there. Will Shed 35 have enough ooomphf to work seven days a week? It is a long way to walk, so most people would drive, but the car park is full of workers at Statistics / the new Customs building during the week, and I have a feeling that it would remain pretty barren and empty during the weekdays. It is a great idea, but the big question is: will it work? Or rather – what would it take to make it work? Your views are welcome…. Huh? You think the market inside the Herd St Post Office has died? I do believe that the good people over at http://www.citymarket.co.nz/ would strongly disagree with you! 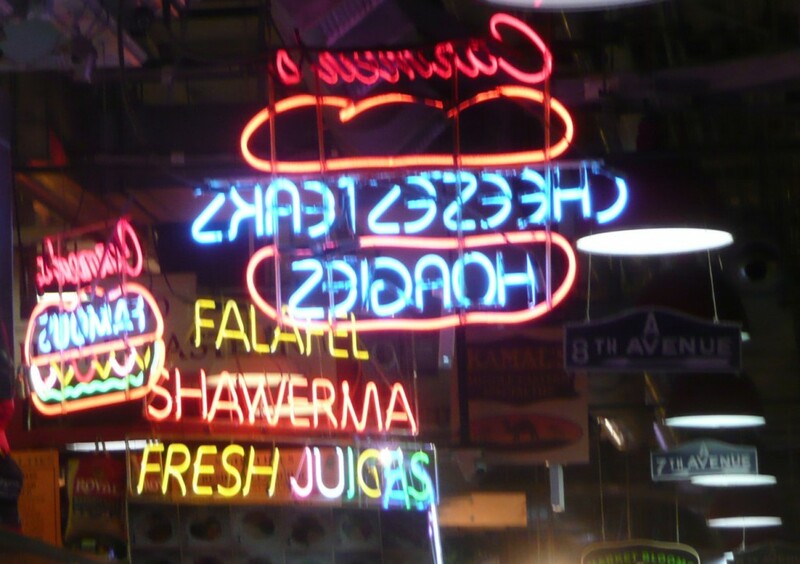 The City Market is usually so full on a Sunday morning that it can be hard to move around. It’s very much still alive. Kim and Joanna – thanks for the update. Glad to hear it is not dead – surprised that it is again reborn. Has it not already had 2 or more previous forms of life? At least – the market it had when the building opened, is not the market that its there now? There is something about that site, in that it is just far enough off the beaten track, for it to die a languishing death without constant input of visitors and passers-by. Hence I worry about the Shed 35 proposal. So: Saturday is Frank Kitts Craft Market? And possibly the Hill St market? Sunday is 3 markets – Willis, Te Papa, and Herd St (is that the ‘City’ market?). Is that right? Or are there more? There’s also a vege market in Newtown on Saturdays. The markets on Sunday are correctly known as the Waitangi Park markets and the City Market I think – Waitangi Park is veges and cooked food, while the City Market is artisanal and booooze. mary wareham – indeed, I shall. So – how do you feel about a possible market in shed 35 ? Will it work? Will it work only if people can drive there? What makes a market work? You say neighbourhood – City Market and Waitangi Park Market both have large nearby resident populations – including Oriental Bay, Mt Vic, and Te Aro. Would a market at Harbour Keys have any residents to pull on? I think the word “market” is a bit misleading here. From what I’ve heard, it won’t be at all like the once-a-week outdoor markets that we currently have in Wellington: it’s inspiration is more along the lines of Auckland outfits such as Nosh and Farro Fresh: i.e. 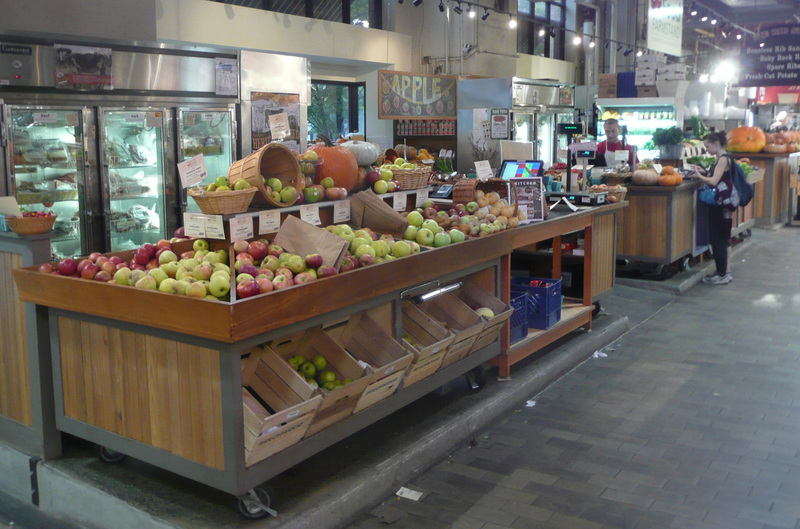 a bit more like a bigger Moore Wilson Fresh than a bunch of independent stalls and produce trucks. As such, much of the trade will come from convoys of Khandallah tractors at the weekends, with weekday traffic from local worker and commuters just a bonus. I looked inside the waterfront Athfield apartments a few years ago: hated it. Huge common corridor, very dark and smelling of rubber and a waste of space. May turn you on, YMMV. . . I like most of the Athfield projects. If I had a magic wand and dictatorial powers I’d open a permanent Asian street food market in Wellington. Such a thing should exist. Not sure about the location of Shed 35 – sounds like a heck of a long trek to the middle of nowhere just to get a bite to eat. On first thought, yes, it is just a bit too far out of the way to be walkable. I mean for all of the hipster demographic that crawl over each other to be seen at the markets, I could only see it surviving if they provide cycle parking (specifically for fixies and ‘shopping-cart’ incarnations. The newly established Left Bank Night Market operates every Friday night, and it’s looking promising so far. where does one find a map of these sheds? I really have no idea where shed 35 is. Sorry – was going to do a map, and then felt it might be patronizing as I thought everyone knew it’s location – clearly not – hold on a minute – will do. ah!… I thought that was called the Harbour Board building? or … I don’t know. I know the location though. Yeah, my feeling is it’s too far to be successful. I don’t mind the concept. It sounds very much like the Ferry Terminal in SF which is very cool. I just think it’s the wrong location. But hope they prove me wrong.